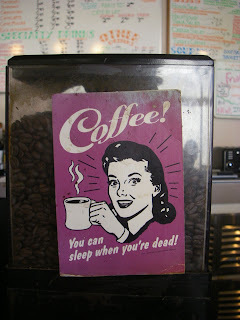 Route 66, a journey: You can sleep when you're dead! This morning the coffee place had a special. Prove you voted, get a free drip coffee or espresso! Had to take them up on that. At the front of the line. Went mentally back and forth on which pastry to order. To Nick I said "Pumpkin scone". He punched something into the register. Then I had to say "No, scratch that. What I meant to say was "Bear claw, heated". Very slowly and deliberately. Nick laughed and said "that was weird!" He snagged a bear claw and stuck it in the toaster oven. "Special" I said. "It's a special ability I have." Its real name is aphasia. Rachel asked if I got anything out of the Valley Medical visit (other than a swarm of blog posts). Yes, I got referred to a speech therapist. After chatting with the young doctor about building trust, I figure this must be his strongest card. Yesterday I called the number and the woman said all new evaluations were on hold. On hold? What does that mean? They're completely overwhelmed with work and aren't taking any more appointments. Until when? She couldn't say. They're working on hiring another therapist and I should call back next week. When I said it sounded like a managerial problem, she had no response for that. Coffee makes it so my brain and my speech operate at roughly the same speed. Maybe it could help find another speech therapist, too! I'm glad you got something, but I'm horrified that even that little bit was blocked by bureaucracy and inefficiency. :( I need to catch up on the last week, but will you go back to Valley Medical? Or were you there just for referrals?